This site is dedicated to the lenticular pictures manufacturing. Now we can offer some software (interlacing, in-between and outer views generation, 2D to 3D conversion, stereobase calculation etc.). You may find here, also, a 3D framesets gallery with ready to use 3D designs for lenticular 3D production. You can order the 2D to 3D conversion of your picture: 50 USD per one working day. Konctantin Makovskiy "Tea drinking", 2D to 3D conversion consumed 4 working days, similar conversion costs 200 USD. Viktor Vasnetsov "Bogatiry", 2D to 3D conversion consumed 10 working days, similar conversion costs 500 USD. New version PSD 3D Converter 2.5 is ready! The program converts a multilayered PSD file to several stereo viewpoints, that are used for lenticular image creating. In new version you can add the zoom and rotation to combine the 3D and animation effects. Upgrade to 2.5 version costs 88 €. 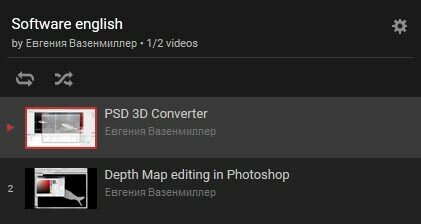 If you bought PSD 3D Converter during 2016, upgrade is free. Please, write me . Cheapest version of PhotoProjector Easy 10x15 cm has French and English interface and Help. This software has a limitation: the maximum image size is 10x15 cm and maximum resolution is 1200 dpi. It's costs only 20 € ! New program Inpaint Tool is inteded for image retouching or for removing unwanted objects from the photo. Look at the Help to Inpaint Tool. VisualPitchCalc calculates a visual pitch (Windows). StereoCard Maker Windows XP is a tool for stereoscopic cards creation (Windows). Stereobase calculates the camera shift for creating left and rihgt eyes images (Windows). PitchTest for lenticular sheet testing (Windows and Mac OS X). Depth Calculator calculates the correspondence between the distance and greyscale level. Depth Corrector calculates the maximum parallax for the 3D lenticular images. Please, check the current version of your software. If you have a previous version, ask your seller or reseller. Attention: the programs could not work without the latest software libraries from Microsoft 2008 or 2010. Please, don't forget to download and install them.